I have good intentions when it comes to making dinner, but lately I am too tired to follow through. I am really productive in the morning, but when 3:00 in the afternoon hits, I am done. All of my motivation goes out the front door. This week I planned a few dinners, but never got around to making them. Luckily, I have the most amazing husband who always steps in to take care of me and our little guy. This week he came home from work and I told him sorry because I didn’t make anything for dinner, once again. He told me not to apologize and immediately went into the kitchen to cook dinner. He made the most amazing Sweet Potato Kale Pizza with Rosemary & Red Onion. He definitely spoiled me with this delicious meal. Josh loves pizza, he could eat it every night, but he usually prefers pepperoni or sausage, nothing fancy. I was surprised he thought “outside of the box” and added a few of my favorite ingredients to this pizza. I know he really loves me:) He rolled out pizza dough and topped it with olive oil, mozzarella cheese, thinly sliced roasted sweet potatoes, balsamic drizzled kale, red onion, and fresh rosemary. All of the flavors melted together to create the perfect Fall pizza. You can use our favorite whole wheat pizza dough recipe or our basic pizza dough recipe. Preheat the oven to 400 degrees F. Place the sweet potato slices and red onion slices in a bowl and toss with 1/2 tablespoon of the olive oil. Season with salt and pepper. Place on a large baking sheet and bake for about 20 minutes, or until the sweet potatoes are soft and tender. Make sure you turn them once during the 20 minutes. Remove from oven and let cool while you prepare the pizza dough. Turn the oven to 500 degrees F or as high as your oven will go. If you have a pizza stone, place the pizza stone in the oven to get hot. On a lightly floured surface, roll out the pizza dough, using a rolling pin. Roll it out to about 3/8 of an inch. Place the pizza dough on a pizza peel or pan that has been generously coated with corn meal. Lightly brush the dough with the remaining 1 tablespoon of olive oil. In a small bowl, toss the kale with balsamic vinegar. 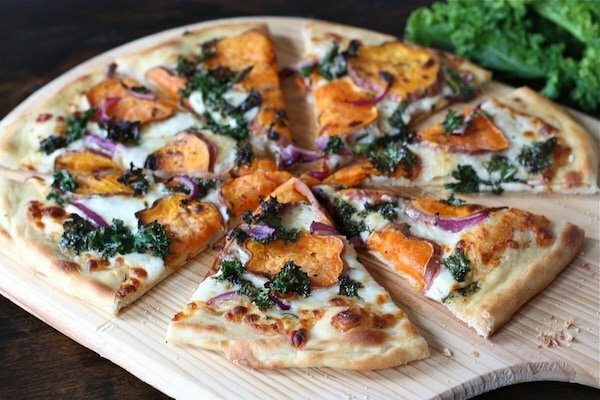 Top the pizza dough with mozzarella cheese, sweet potato slices, kale, red onion slices, and fresh rosemary. Place the pizza in the oven-directly on the pizza stone, if using one, or on the oven rack. Bake for 10-15 minutes or until pizza crust is golden and cheese is melted. Remove from oven and let cool for a few minutes before slicing. Slice and serve warm. The dreaded 3PM slump! 😉 This looks wonderful- love all the colors! Your pizza is beautiful and ever so tempting! Love this! This pizza is so unique and tasty looking. I recently tried sweet potato on pizza and loved it! This sounds fabulous. way to go josh! this looks amazing…i don’t always love kale, but throw it on a pizza like this and i’m all in! OMGYUUUUUM. I just made something really similar to this! Only I used butternut squash instead of sweet potato. But good heavens, my next pizza will be DRENCHED in sweet potatoes. Not that sweet potatoes really “drench” anything. Thanks Alison! We can’t wait for your visit! The perfect improvements to pizza. We love this. i love thin crust pizzas! Your pizza looks delicious! Love that you added kale and rosemary! This has my name written all over it! Seriously i could probably eat the whole thing myself. Nice work Josh!!! This sounds like such a flavorful (and healthy – yay) pizza. Josh is definitely thinking out of the box and I’m sure you’re loving the results. wow what a husband! this looks stunning and the flavor combinations sound perfect. Aww what a great hubby and the pizza look seasonal indeed. Great color scheme and I love a thin crust. BTW of course you are tired nothing lazy about that!! Ooo, I love the kale and sweet potato combination. This looks wonderful! Saw this on instagram the other day…LOVE!! This is so weird. I need groceries… bad but I have just these ingredients. Saturday breakfast…or lunch, I think so! Saw this on instagram and was immediately jealous of your meal. Aww Josh knows you so well! And you’re right…he does adore you, I can tell! This pizza looks amazing. I can’t wait to try it! That pizza looks so good! And it came just in time. I have been chronicling in my blog about my attempts to use up these two, giant, sweet potatoes our neighbors gave us. 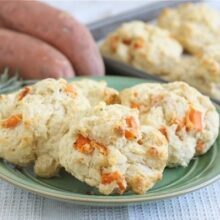 I have already made your sweet potato biscuits which were fantastic. I am definitely going to have to try this pizza. What an awesome pizza! It was also very sweet of Josh to make dinner for you :). You guys are such a good team! And that pizza looks divine! I keep telling my kids they need to stay in school until 5pm. 3pm is my nap time and gathering from one school to the next is not where I want to be at that time! Pizza looks yum! this looks wonderful! I love pizza what great toppings!!! It looks amazing! Love the flavors and colors of this pizza. Totally “pinned” this recipe because I am “Pinterest”ed in making it! What a great idea for pizza; love the combination! Josh is such a great guy. What a sweetheart Josh is! But I know you’re working hard too, so I’m glad he’s there to help out. I have a whole file devoted just to pizza recipes. This is now filed and on our menu for next week! This looks like the perfect easy recipe to make when you’re new-baby-exhausted. I’ll be sure to bring this one over to my friend when she’s in the first few weeks of baby-dom. Now if only I could get my husband to make me a beautiful pizza like this! This is such a unique combination of ingredients…and how pretty this is for the fall! or anytime for that matter. Love the idea of sweet potatoes. Looks delicious. Sweet Potatoes on pizza? I’m in heaven! I love it!! Hope you get some rest (or maybe you should be tired more often at dinnertime ;). You’re so lucky to have a husband who loves you so much and knows how to cook food you like. Yum–looks delicious! I’d be the only one in my house to eat that kind. But that’s alright with me. Mmm, sounds delicious and it IS pretty! I say let him pamper you 🙂 Sounds like you are the perfect pair! Lucky girl, looks delicious and healthy too! I love squash, I love pizza, I’ve never put the two together. Sounds absolutely delicious! I could eat pizza every night as well (and kale too). I like to switch up the toppings though. This is such a creative combo. 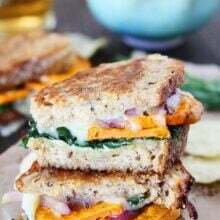 Never would have thought to use the thinly sliced sweet potatoes, but I bet it is amazing! I totally understand you. Around 3 pm i need something sweet to keep me going for the rest of the day. this pizza sounds like a wonderful dinner idea. love all the ingredients! This pizza looks delicious, and your husband sounds so sweet! Don’t feel lazy not making dinner though – taking care of a newborn all day (and night) while you’re still recovering from birth yourself takes a lot of energy. When I was newly postpartum and I would lament that I didn’t get anything done all day when my husband got home, he would say “you fed and changed the baby, and fed yourself too – you got everything you needed to do done.” In a few months, everything will be easier! Until then, just enjoy the TLC your husband is gifting you. 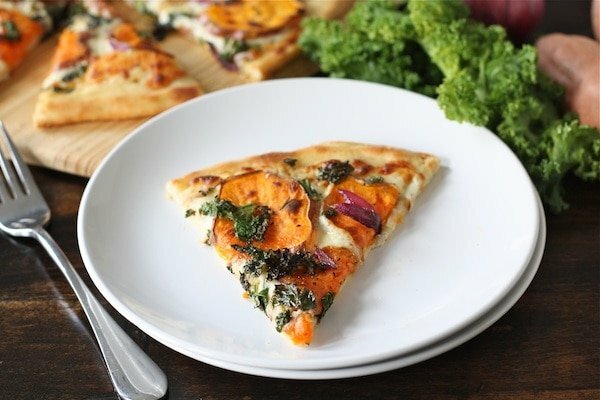 I absolutely love sweet potato and kale but have never thought of putting them on a pizza before. I’ll be trying your recipe for sure. Thank you for sharing!! i cannot get enough of sweet potato. i always crave it, and butternut squash. sadly i’m not a big fan of pumpkin, yep its true. but sweet potato on pizza, oh hello! This looks so magical, I want it for dinner! Wow, that looks and sounds amazing. I have some kale in my freezer, and it would be perfect for this! I would just drizzle the kale with olive oil and season with salt and pepper. Another option is to use apple cider vinegar if you can have that. 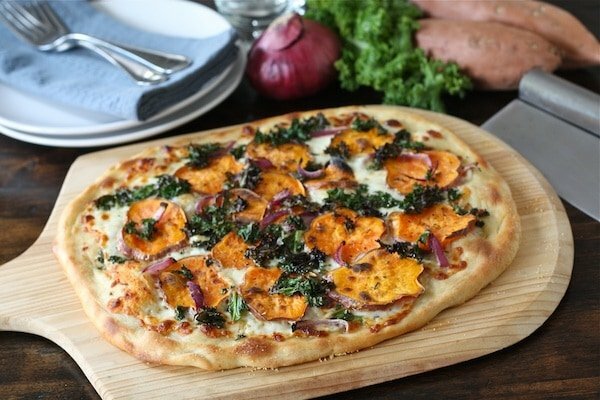 We love sweet potatoes but never would have dreamed of putting them on pizza & with Kale? Hmmmm, even though it is nothing like our usual pizza I think that we might like it. 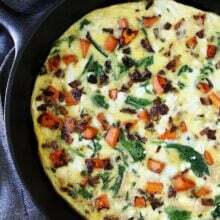 I think though that maybe we might add some mushrooms, ham or bacon along with the sweet potatoes and kale. Holy cow – this is delicious! We chowed down on this pizza and expect it will be the late fall/winter favorite pizza! My daughter (6) can’t wait to bring this for her lunch tomorrow! Glad you liked the pizza! I made this for dinner tonight and it was so good! I think it would be even better with some crumbled bacon, though. It would add some more texture and deeper flavor. I will be making this ASAP. Also you are my new blog obsession. Pingback: this week’s dose of inspiration. | simply chic. I’m making this ASAP!!! Thanks for the idea. This looks delicious and I am excited to try it. I am also excited to try the pizza dough recipe that you have. 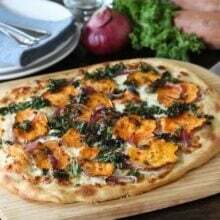 I was wondering – since the pizza dough recipe you posted made two pizzas in that particular post (peach, basil, etc pizza), did you use half the recipe to make the sweet potato/kale pizza? Or did you just make a larger pizza? Thanks! You can freeze half of the dough if you only want to make one pizza. Just wanted to say I made this this weekend (with a few tweaks, added prosciutto on top, whole wheat crust, ricotta & smoked mozz). Big success! Thanks for the inspiration. Glad you liked the pizza!! I made this. I did goat cheese and didn’t have any onions (rookie mistake) so used garlic instead, and also used a garlic olive oil as my base and it was delicious. I have 18 year old balsamic that I used. Adding the balsamic was so perfect!! I bet the goat cheese was excellent! Glad you liked the pizza! I made this tonight, but with spinach in place of kale. Very tasty! Pingback: dinner tonight -- pizza and brussels sprouts | Now You're Cook.in'! Made a slightly adapted version of this and loved it! I tried this recipe, and had great success! I posted a picture of it on my website. Thanks for the awesome idea! Made this tonight for dinner and the whole family loved it, including my 10 month old! Thanks! just tried the pizza. absolutely delicious!!! I didn’t have rosemary so I sprinkled thyme on top and it worked really well. As a newbie to kale, I wholeheartedly approve! Thanks for this delicious recipe! I was looking for a way to use up some kale, and this was so good! I added some pesto to the pizza dough before I added the toppings, and I devoured it (I ate half of it!). And it wasn’t hard to make – the toughest part was getting the pizza dough to stretch out! Thanks again! Wow this came out fantastic! 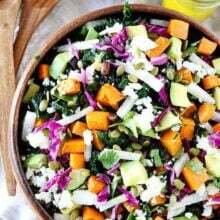 I came across this recipe when trying to find something different to use my sweet potatoes for. I followed the recipe except I swapped out the kale with red chard since that’s what was in my CSA box this week & we’re GF so I used my own whole-grain GF crust recipe. My 5 & 8 yr olds both ate 2 slices without scraping all the toppings off & only eating the crust which is unheard of here! Making this as we speak- although I’m adding applewood smoked bacon-I’ll report back on how it turned out! I used 1 1/2 cups kale and it looks like MUCH more kale than is photographed.It’s fine with me- because kale is very healthy, it just gave my pizza a very different look-mostly green! 🙂 The addition of bacon was wonderful. We LOVE this!!!!! It is now a staple at our house. I love “normal” pizza, but this works for me, too. So yummy! I found this on Pinterest and made it the other night. The flavors are so perfect together. I will definitely be making this again. Sweet potato and pizza two of my very favorite things! Thanks!! Made this tonight along with some traditional pizzas for my family…the sweet potato one was for me! I didn’t have kale, so used some baby spinach. Pretty happy with the results!! I also added some fried garlic (from Thailand) and my homemade hot pepper rings. I will definitely make this again! Made this today (with an olive oil crust from Artisan Bread in Five Minutes a Day) and added crumbled goat cheese on top. Divine. Do you think spinach would go well with this pizza? Or is it too flavorless w/o the kale? Made this. Loved it. Used Mel’s kitchen cafe quick and easy pizza dough. (I have that one memorized.) Followed the recipe as written. Such a wonderful fall flavor. Will be adding to our pizza rotation. Thanks! Delicious. My husband and I loved it! In the second line of the instructions you say “place the sweet potato slices and red onion slices in a bow and toss….” In a bow my brain thought? I really thought you wanted them artistically arranged on the baking sheet in a bow shape…. hmmn, wonder why she’s doing that? How cute? Oh, in a bowl! Recipe looks and sounds lovely and it will be tonight’s dinner. It is supposed to say bowl:) Fixed the typo!